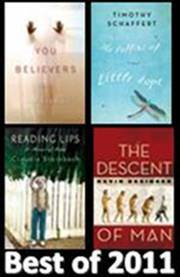 Books published by Unbridled have ranked among the best of the year as readers and booksellers have again placed their votes for the best books of 2011. At the end of every year, lists are compiled by bloggers, booksellers, and avid book readers. This year, Unbridled Books has had four titles make the lists as well as one title that was released in paperback. Here are the books and their respective lists. Each entry is linked to the web page that details the award. Click the name to see the entire article.